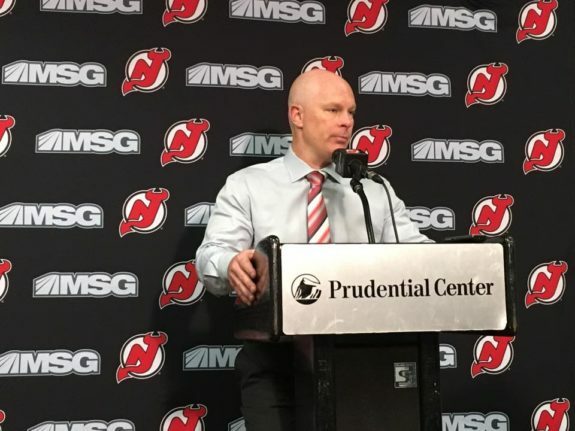 On Thursday, the New Jersey Devils announced a multi-year extension for head coach John Hynes. In his three-plus seasons as head coach, Hynes has compiled a 125-122-38 record. That includes finishing 44-29-9 last season, which was good enough to get the Devils into the playoffs for the first time in six seasons. Despite this season’s struggles, the organization has made it clear they want Hynes to lead them through the rest of their rebuild and beyond. Here’s why it’s the right move for the organization moving forward. 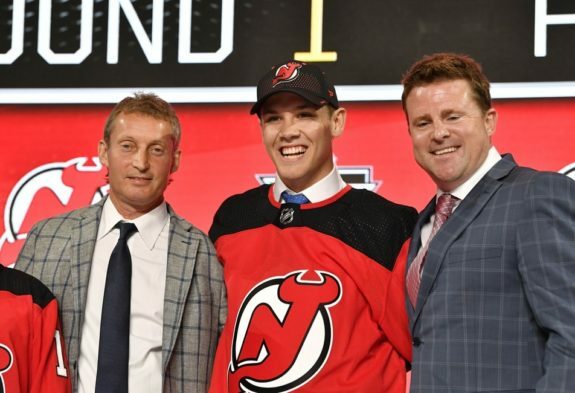 Hynes did not inherit an easy situation when the Devils hired him in 2015. They were one of the NHL’s bottom feeders and had one of the oldest rosters in the league. Their farm system was also depleted and didn’t have much in the way of blue-chip prospects. But the Devils didn’t hire him to compete for Stanley Cups right away. Learning and adapting is what Hynes has done as Devils’ head coach. He enjoyed a successful first season in 2015-16, which was followed by the Devils’ worst season in decades. They followed up that season with 97 points and their first playoff appearance in six seasons in 2017-18. Things haven’t gone the way anyone has hoped this season, but it’s hard to pin all the blame on Hynes. Prior to Mackenzie Blackwood’s arrival, the Devils struggled to get saves from their goalies. That’s not something Hynes can control. What he can control is how the team plays, and they’ve posted decent results at five-on-five through most of the season, which is an encouraging sign given their struggles. There’s long-term thinking that goes into handing out a multi-year extension such as Hynes’. And that thought process starts with this offseason, which is the most important of the Devils’ rebuild for a number of reasons. The first, and most important reason, has to do with reigning NHL MVP Taylor Hall. He’ll be eligible to sign a long-term extension with the Devils anytime after July 1, 2019. Hall has made his feelings about Hynes clear, too. Firing Hynes a year before Hall is set to become an unrestricted free agent wouldn’t be a good look. It’d be an untimely shift in the Devils’ rebuild. And it would set them back years after all the hard work they’ve put into to change the team’s culture. I don’t think that scenario would appeal to Hall much. Another reason the Devils need Hynes to stick around has to do with free agency. Shero has not been a big spender as Devils’ GM, but that may change this summer. They’re projected to enter July 1 with over $31 million in cap space. Some of that will have to go into re-signing Hall, but they’ll still have plenty of space after the fact. And having that space after the fact could prove significant. Potential UFAs this summer include Erik Karlsson, Artemi Panarin, Matt Duchene, Mark Stone, Jeff Skinner and Jake Gardiner. It’s a deep class with elite talent where you’d want to spend top dollar. Having a new coach in place, or no coach at all, could affect how players view New Jersey as a free-agent destination. The Devils don’t have all the pieces to be consistent playoff contenders, but some of them are on the way. Even though their farm system isn’t as deep as other teams, there are a few prospects who are on the cusp of making an impact in the NHL. The most notable prospect is Ty Smith, who impressed the Devils during the summer. He’s been a force in the WHL and played a major role for Team Canada at the World Junior Championships, even though they were upset by Finland. He’s a good bet to be on the Devils’ 2019-20 roster. Another prospect to keep an eye on is Jesper Boqvist, who’s having a phenomenal season in the SHL. He has 22 points in 29 games, which puts him seventh in scoring in the SHL. There’s no rush to sign him, but he’s someone the Devils will want on their roster next season. They also have some prospects making an impact in the NHL as we speak. And if you think I’m talking about Blackwood, you’d be right. He has a .945 save percentage in five starts and has provided a major lift in net. While it may be too early to call him their next franchise goaltender, he’s shown he has a high ceiling, and that could alter the Devils’ rebuild in a positive way. You might be wondering what any of this has to do with Hynes. The bottom line is he needs the right pieces to help the Devils contend. Building from within the organization has been a sticking point of Shero’s rebuild. Couple these players with a free agent signing or two this summer and Hynes will have the most talent he’s had in New Jersey. That’s why it makes sense to keep him around and see what he can do with a full arsenal. He didn’t have much to work with last season and got the Devils to the playoffs. Give him the tools he needs, and they will be contenders on a year-to-year basis.